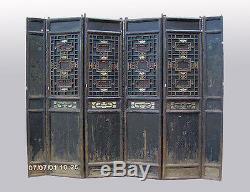 Rare 6-Panel Chinese Antique Carved Wooden Screen Room Divider. Dimension: Middle 4 panels: 22''W x 2 1/2D x 90 1/2''H (each). 2 Outside panels: 11 1/4"W x 2 1/2"D x 90 1/2H (each). A set of 6-panel Chinese antique wooden screen / room divider with hinge & beautiful hand carving. These 6 panels are very rare and collectible pieces. No any additional charge unless customer request other special service. Ages in the descriptions are approximates. Please remember that old and reproduction furniture is different from brand new items. They will have splits, scratches and normal age wear. Payments received with no item number cannot be processed. Decor of China is specialized in Chinese antique furniture and home accessories. We will help you to make your office and home much more personalized and stylish. Our retail store is located at historic Chinatown, Vancouver, BC Canada. Open 7 days a week 11:30am - 5:30pm (PDT). Thank you for your time and interest in our items. The item "Rare 6-Panel Chinese Antique Carved Wooden Screen Room Divider" is in sale since Tuesday, May 3, 2016. This item is in the category "Antiques\Asian Antiques\China\Other Chinese Antiques". The seller is "decorofchina" and is located in Vancouver, British Columbia. This item can be shipped to United States, Canada.